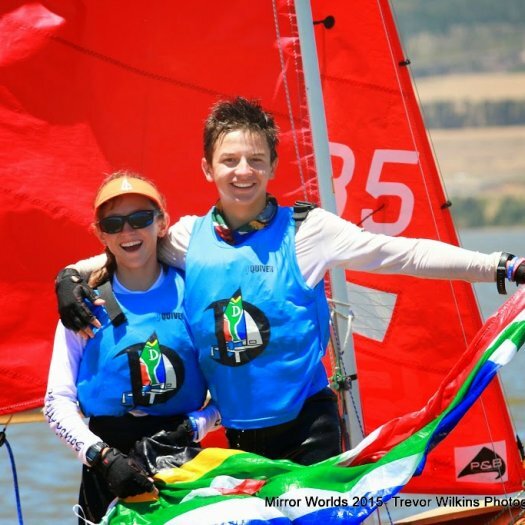 Of Mirrors and Mentorship - the whole story of the 'Family Robinson' and their path to winning the Mirror Worlds - twice! After the 2013 Irish Worlds, I was asked to write something about the family’s experiences. It was eventually posted on the Irish afloat.ie website. 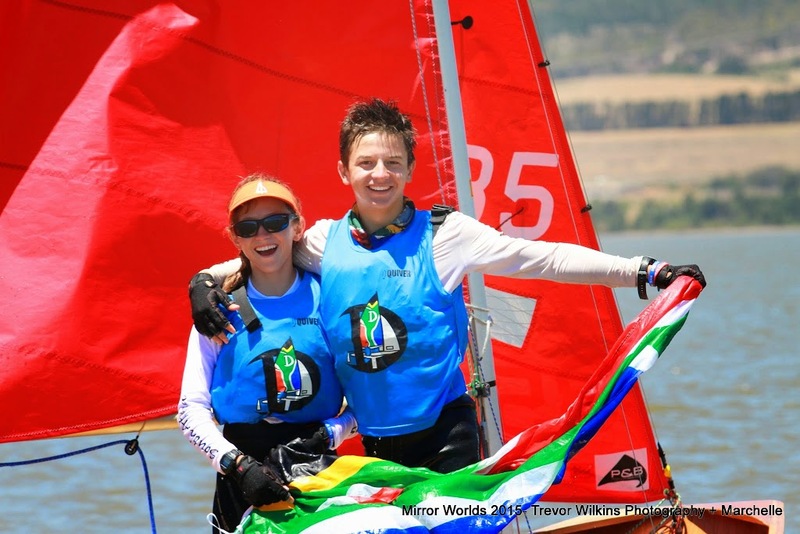 Grant Eckermans asked me to finish off the story after the 2015 Worlds for the South African Mirror Class web site, which I did. I am sure that you will recognise the first part, but hope you will find the second part interesting. Sailing in Africa - what an experience! Theewater SC near Villiersdorp, in Western Cape, situated in the Cape winefields and fruit growing area, must be one of the most stunning venues on earth. 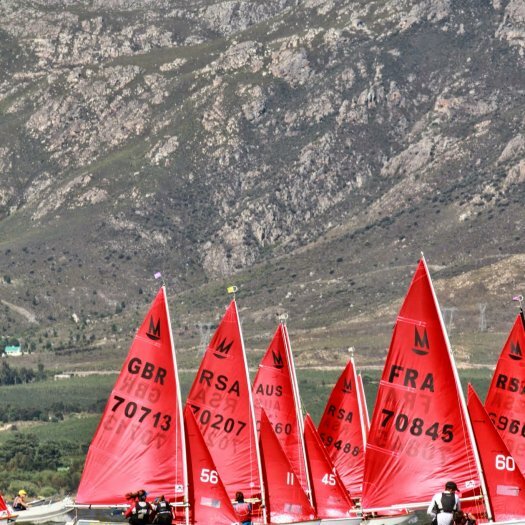 Surrounded by imposing mountains, forests and fruit fields - sunshine in abundance and wind a plenty - perfect conditions for the gathering of the Mirror fleets from UK, Australia, South Africa, Japan and France. 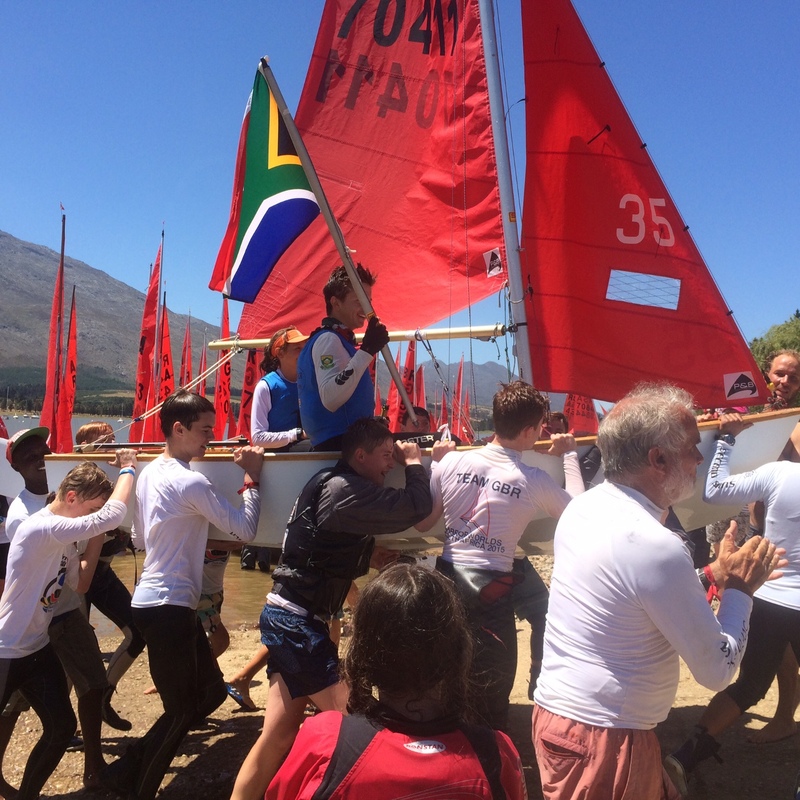 The fleet represented the full spectrum of Mirror sailing - wooden boats and plastic boats, juniors and parents/children, gaff rigs and single masts. The Izivungu Sailing Academy from Cape Town that supports sailing development for township children brought their special African flavour to the regatta - including their excellent band and dancing. Day 5 started with a strong wind blowing down the valley from Villersdorp & early talk from the locals was that it would not last, dropping by 12:00, so a postponement was likley. In the event talk of a postponement proved to be dis-information. There was no AP ashore at 11:30, so boats launched for a 12:00 start. 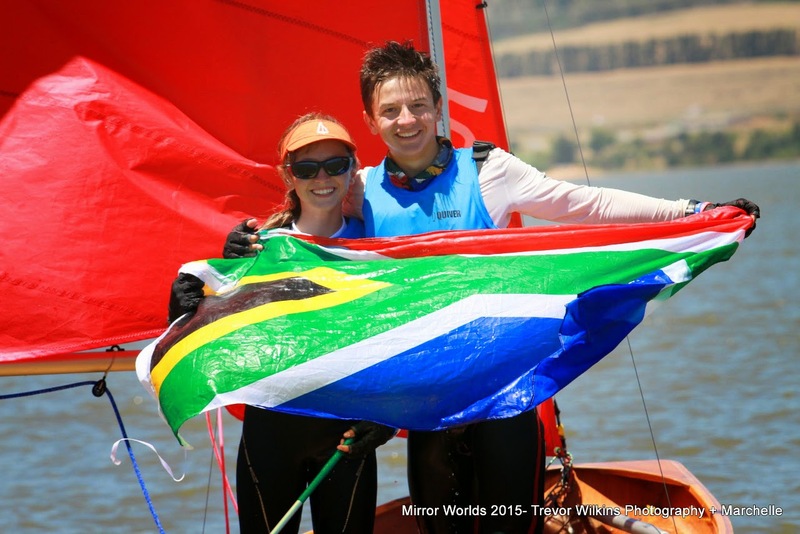 Michela & Ryan Robinson (RSA) and could not be caught, unless they picked up a non-discardable disqualification. Michaela & Ryan Robinson have built an unassailable lead on day 4 of the Mirror Worlds (dispite retiring with a main halyard problem from race 10) but the next 3 places are tight with Eleanor Keers & Izzy Pugh (GBR), Gemma Keers & Imogen Bellfield (GBR) and Simon & Tyson Barwood (AUS) all vying for a podium place. One race is planned for today to finish off the regatta - the wind is up and the sun is shining. Another day in paradise! 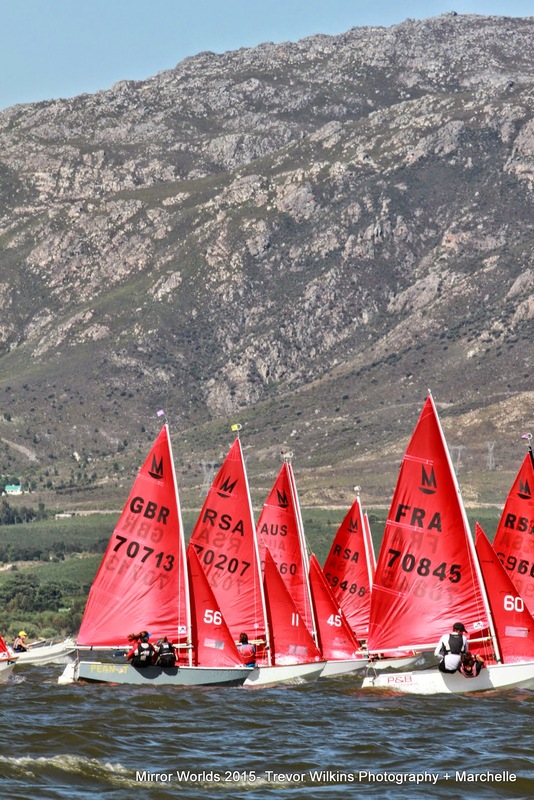 At the end of today's 3 races, Eleanor Keers & Izzy Pugh are level on points with Michela & Ryan Robinson (RSA). Simon & Tyson Barwell (AUS) are third. Scarlett & Esme Shepherd are 4th, level on points with Douglas & Charlotte Rafterson (AUS) in 5th. Elder sister Gemma Keers & Imogen Bellfield sitting in sixth with more South Africans and the French boat hot on their heels. The GBR boats excelled in today's strong winds.